Twenty years ago today, February 9, Mathieu Kassovitz’s “La Haine” opened in select theaters and began its theatrical rollout in America. The film was already an international sensation at this point, having sent shockwaves through the 1995 Cannes Film Festival, where it received a prolong standing ovation and the Best Director prize, but nothing could have prepared domestic audiences for the movie’s political and social force that hits like a visceral wrecking ball. Starring Hubert Koundé, Saïd Taghmaoui and Vincent Cassel (in his breakout performance), “La Haine” is set over 19 consecutive hours in the lives of three young adults living in the impoverished, multi-ethnic French projects. A far cry from the golden City of Love we normally see on the big screen, “La Haine” captures the urban realism of its setting through stark black-and-white cinematography, following these young men as they hustle to survive and support their families amongst mounting racial and social tension from the police and French purists. In the 20 years since the film’s U.S. release, “La Haine” has remained one of the most searing foreign titles of all time. In celebration of its anniversary, Indiewire reflects on how the film continues to remain relevant two decades later. It says as much about the present as it does about the past. A story of social unrest, “La Haine” proves it has double vision, reflecting the past while anticipating the future. The stories of Makome M’Bowole and Malik Oussekine, victims of police brutality, inspired Kassovitz to write the script and focus on the clash between the French police force and the youth of the banlieue. The banlieue refers to the suburban zones that surround French cities, equivalent to what the U.S. considers “housing projects.” The film confronts the alienation and confinement of the banleieu’s disenfranchised youth. Similar to Spike Lee’s metaphor of temperatures rising in “Do the Right Thing,” the characters in “La Haine” can only handle so much heat until they are pushed to their limit. Resorting to violence, the urban riots are driven by survival as much as they are by protest. The film is not subjective to its time period nor its social and political situation, but universal in its context. Considering the recent protests revolved around incidents of police brutality in America, the film is more relevant now than ever. The premise is timeless and borderless because it gives a voice to those who are silenced when they desperately need to be heard. It showcases the power of media. 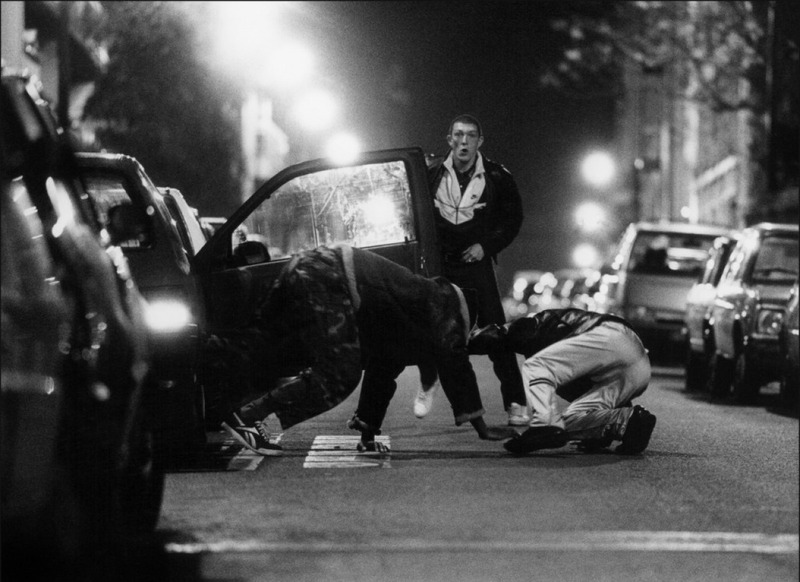 “La Haine” demonstrates how extensive the power of media can be. In the film, the news media is bias, portraying the youth as menacing while failing to realize their stigmatization only contributes to the negative feedback loop, in which the youth’s lack of legitimate representation further hinders their access to opportunities. In one scene, news reporters attempt to question Hubert, Vinz and Said about the riots from the night before. Kassovitz frames his screen within a screen when the boys observe a wall made of TV screens, trapping them in the boxed ratio of media. The news broadcast announcement, confirming the death of their friend, interrupts a montage of war images from Bosnia. The daily exposure to such brutal content normalizes and legitimizes violence in their eyes. Consequently, they act counterintuitively, using violence as a catalyst of social change. Ironically, the film itself was an example of the power of media, as it sparked the Noisy-la-Grand riots only a few days after its release in France. It uses archival footage to contextualize its timelessness. The film begins with authentic archival footage of urban riots. Opening a narrative film with a documentary reel is a clever way to emanate a sense of realism and build a historical and political backdrop. Recent hits such as “Argo” and “Milk” have used a similar strategy. From the footage, the film cuts to a Molotov cocktail spiraling towards a satellite image of planet earth. In suiting fashion to the story of a falling society, the screen ignites from the explosion before cutting back to the archival footage. Set to Bob Marley’s “Burnin’ and Lootin,'” the clips feature rioters and police preparing as if two armies were lining up for battle. The use of archival footage is a valuable technique because it immediately sets the tone and contextualizes the fictional story with social realities. Kassovitz made technical strides as a filmmaker through intertextual and innovative shots. The camera starts behind Vinz, moves towards him, and then over him as he spits in the sink. Without having to cut, it transforms into a POV shot, but how does Kassovitz do this without accidently capturing the cameraman in the mirror? Believe it or not, Kassovitz doesn’t use a mirror. He uses two actors, a body double with his back turned and an open frame with Cassel on the other side to create the illusion of the mirror, allowing him to capture the shot in one continuation motion. In another shot from when the boys first arrive in the center of Paris, Kassovitz recreates a shot from Hitchcock’s “Vertigo” by moving the camera forward on a dolly while zooming out at the same pace. The dolly zoom creates a disorienting sensation like that of actual vertigo to reflect the trio’s physical discomfort in the strange new environment. It transcends the notion of French identity. The film is an unconventional coming-of-age story, but it’s also an exploration of the modern French identity because of how Said, Vinz and Hubert’s friendship is a cultural melting pot that defies the pureness of the old French image. The multi-ethnic dynamic reflects the reality of France at the time, trading the national colors of the old France, bleu-blanc-rouge (blue-white-red), for the colors of the new France, black-blanc-bleur (“black-white-Arab”). Kassovitz ironically exposes the flawed logic behind France’s relative definition of social solidarity. It is not differences in race, but in culture that publically outs them as “others” and drives their poor treatment. Following decolonization, the banleieu was a political housing solution to compensate for the influx of immigrants. Each boy represents a different location and culture: Hubert has Caribbean roots, Said is beur, a colloquial term for French people with grandparents of Northern Africa descent, and Vinz accounts for the Jewish Eastern Europeans. Similar to the film’s double vision, the historical context of their diverse ethnic identities blurs the line between present and past, questioning whether they are treated like citizens or colonial subjects. The film reveals the importance of geographical/topographic location. In both form and content, Kassovitz emphasizes the spatial relationships between the characters and their surroundings. His use if location and mobility explore the confinement of impoverished groups to specific urban corridors and recalls American films such as “Boyz n the Hood” and “Menace II Society.” “Boyz” opens with a full-frame shot of a stop sign, whereas, in “Menace,” a streetlight turns red at a timely moment. They explore not only the literal lack of transportation but also the imposing institutional limits that lead to confinement and social immobility. In “La Haine,” the characters get to where they want to go, but the grass is not greener on the other side of the tracks. Half of the film is set in the suburbs and the other half is set in the cosmopolitan hub of Paris. Despite only being a train ride away, going from one place to the other is like entering another universe. Kassovitz visually encompasses the characters’ relationship to the environment. In the banlieue scenes, which take place during the day, Kassovitz uses short lenses and long takes to emit comfort and a sense of closeness between the people and the environment. On the contrary, the Paris scenes portray the trio as fish out of water. The darkness of the night builds off of the director’s use of long lenses and short takes to create a distressed aesthetic that protrudes the boys from the landscape. It depicts how pop culture finds its roots in youthful anarchy. In the aerial sequence, the song the DJ plays is a mashup of NTM’s “Nique la police” and Edith Piaf’s “Je ne regretted rien,” highlighting the immense gap between the generations of working class people. The camera travels through the air like musical sound waves, echoing the American hip-hop movement. With the movement of a cloud in the sky, the camera imitates the pop culture movement, as it spreads through the globe and popularizes the gangster lifestyle, glorified in the lyrics. In accordance with the “Taxi Driver” reference, Vinz references MacGyver to justify hotwiring a car. Vinz is a byproduct of dangerous interpretation. He does not only mimic movie stars in demeanor, but he also does so by invoking their acts of subversion. The clothes, the music, including the unforgettable break dance scene, and even the language contribute to the portrayal of youth pop culture. The vibrant language is known as “verlan,” a revived form of 1970’s black slang, in which the syllables are inverted (“té-ci” instead of “ci-té”). The film is not just a critique of the institutions that alienate the youth of the banlieue but also a critique of the pop culture that influences the youth to rely on a violent gun culture as a solution. The elements of surrealism are essential. “La Haine” is dialectical, combining the opposing styles of surrealism and realism to enhance the meaning and impact of the film. Since the premise is not easily spelled out, Kassovitz unifies contrasting thematic elements because they say more as a package than they do individually. Realism gives the film its backdrop, while the surrealism and moments of dark comedy generate the lively rhythm and entertainment value. The surrealism is inherently self-reflexive because of its blatancy, but it plays out in the film’s favor, using the make believe to reveal a truth about reality that is so hard to see. For instance, although they appear out of place, the giant faces of the two famous poets, Rimbaud and Baudelaire, which are painted on the sides of buildings, help construct the idea of cultural surveillance. The surreal moments, such as Vinz randomly seeing a cow, emphasize his status as a dreamer. He fantasizes about murdering a cop, but the ending ironically proves that he lives not in a dream but in a perpetual nightmare. It ends with the shot heard round the banlieue. In the spirit of filmmakers like Spike Lee, Kassovitz creates uncomfortable scenarios not to give an answer to the viewers but, rather, to inspire them to ask more questions. At the end of the film, the explosion of the ticking time bomb will make you jump out of your seat. Vinz finally gives up the gangster fantasy and makes a responsible decision by handing the gun over to Hubert. However, a group of revenge seeking cops stops them, pinning Vinz against the car. The officer points the gun at his head and accidentally pulls the trigger. The gunshot freezes the crowd as Vinz drops to the concrete. Hubert runs to the scene and pulls out the gun. It’s a stand off; Hubert and the cop point their guns at one another like an old fashioned duel. The screen goes black and a gunshot echoes. The film ends on this open note, never revealing who lives or who dies. Kassovitz does not depict who is the hero nor does he depict who is the villain. Society pulls the trigger and everyone feels partly at fault. It’s a final moment that guarantees the film will live on for centuries.